"This desert is made with sweet rice flour, it's sticky, sweet, and so delicious! I grew up with it at many family gatherings. It's eaten on the island of Guam, where my family is from, and also Hawaii." Preheat oven to 350 degrees F (175 degrees C). Spray a 9x13-inch glass baking dish with cooking spray. Sift together the rice flour, sugar, and baking soda; set aside. Beat eggs with evaporated milk, coconut milk, and vanilla extract. Add flour and butter; beat until well combined. Pour into prepared pan and bake in preheated oven for 30 minutes. Allow to cool completely before cutting into small (1 1/2 inch) squares. This was easy and pretty good.. Served to my friend from Hawaii. He was impressed. We liked the taste of it, but i think it needs more time in the oven. Will have to try this again. 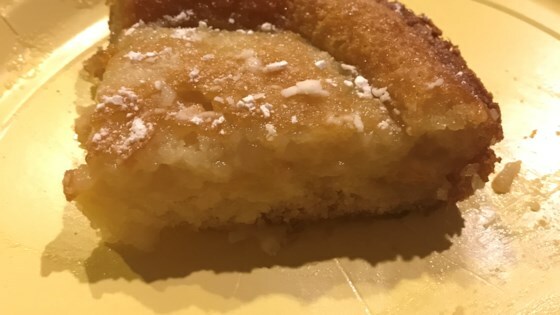 i made a few changes to this recipe.i baked it about 5 minutes longer and it came out really good but i was a little squisher than i wanted it to be but overall i'm going to say it was great!! !